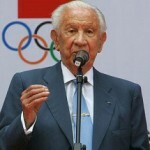 Comments on: "Juan Antonio Samaranch Quotes: Our philosophy precedes from the belief that sport is an inalienable part of..."
We peruse one ideal, that of bringing people together in peace, irrespective of race, religion and political convictions, for the benefit of mankind. I want to express my deepest apology to the athletes, the people of Salt Lake City in Utah and the millions of citizens worldwide who love and respect the games. Spain is not a racist country. Olympism is a philosophy which, by blending sport with culture, seeks to create a way of life based on the joy found in effort, the educational value of good example and respect for universal ethical principles.